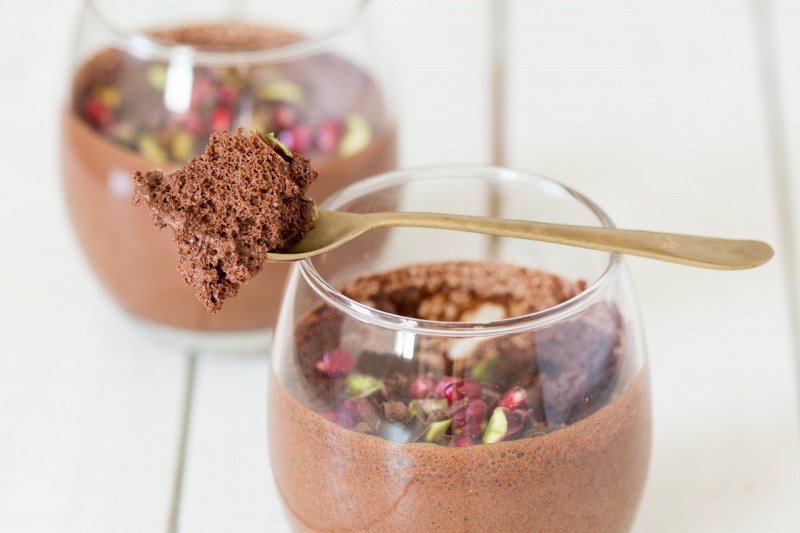 I’m so excited to bring this simple yet indulgent vegan chocolate mousse with aquafaba recipe to you, guys. As I’ve already mentioned in my previous posts, ever since I’ve read about the brilliant invention of aquafaba ‘egg whites’, I’ve been massively obsessed with it. I’m part of an inspiring Facebook group solely dedicated to making things with aquafaba and I can tell you that every single person who tries to whip chickpea water like egg whites has the same reaction – that of amazement mixed in with excitement. It’s because it’s a blooming genius invention. It opens up so many possibilities, not only for vegans, but also for people with egg allergies. Who would have thought that something as basic as whipped chickpeas (most beans, in fact) cooking water can yield such amazing results. To make sure I have not gone mad and this thing doesn’t, in fact, taste vile, I made this mousse twice while a couple of our omnivorous friends were staying with us. Not only did they LOVE the dessert, but when I was making it the second time, they watched me whip up the chickpea water into stiff peaks as they could’t quite believe that it is as simple as it sounds. They were so impressed and vowed to make this dessert once they get home. It’s the best compliment I could have wished for. For the sceptics amongst you, let me re-assure you, this dessert DOES NOT taste of chickpeas at all. 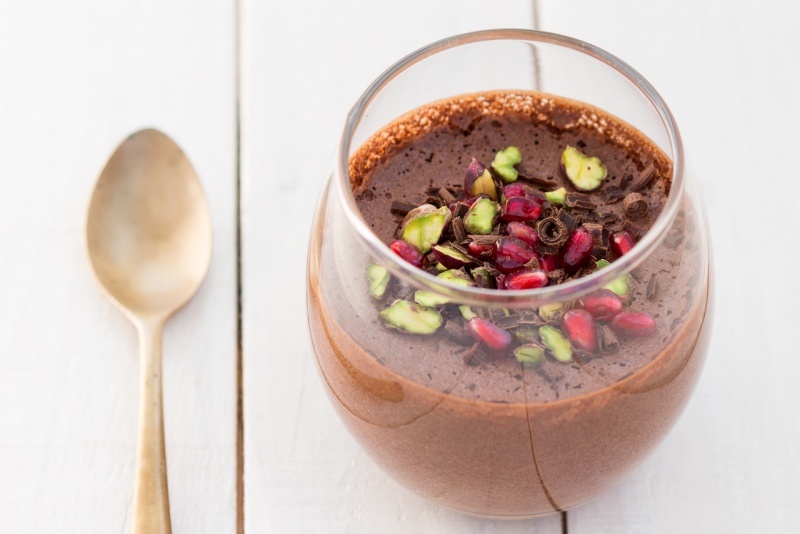 If I hadn’t just told you what’s in it, you would have thought that it’s an indulgent chocolate mousse, just like your grandma used to make. Go on, try it for yourself – you’ll want to shout from the rooftops about it. 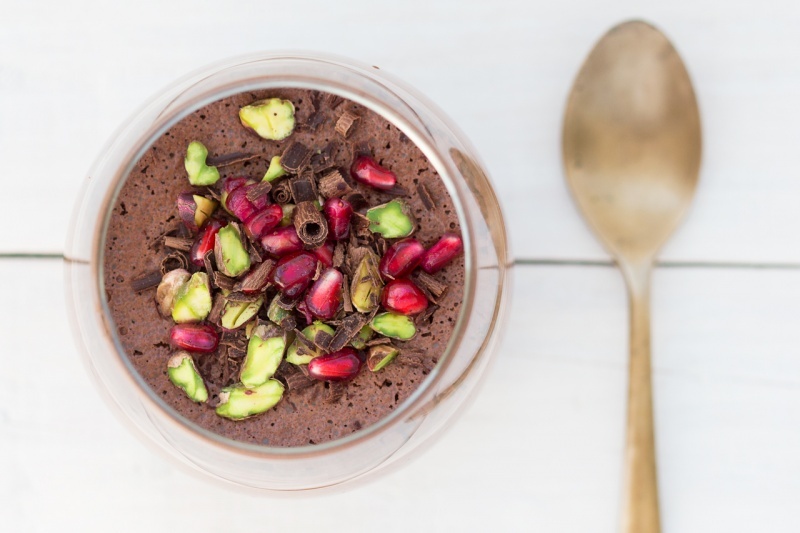 PS: If you make this vegan chocolate mousse, don’t forget to tag me on Instagram as @lazycatkitchen and use the #lazycatkitchen hashtag. I love seeing your takes on my recipes! This recipe contains a step-by-step VIDEO (see above). Break the chocolate into smaller chunks and place it in a glass bowl together with a splash of plant milk. Plant milk isn’t necessary, but I found that it stops chocolate from seizing (i.e. little chocolate particles from forming in the mousse) once it has been incorporated into stiff aquafaba. Place the bowl over the water bath and allow the chocolate and the milk to heat up very slowly (that’s important as chocolate is very sensitive to high temperatures) and melt into each other – refrain from stirring until chocolate is completely melted. Once the chocolate has melted into the plant milk, mix the two gently with a wire whisk. Take the bowl off the heat and allow it to cool down a little. Open your tin of chickpeas and drain the chickpea water into large glass bowl. The bowl and the utensils you’ll use to whip aquafaba need to be completely grease-free as even the tiniest grease residue can prevent aquafaba from reaching stiff peaks. One 400 g tin should give you 240 ml / 1 cup of chickpea water. Reserve the chickpeas for another use, like a salad or burgers. I recommend adding a teaspoon of acid (like vinegar or lemon juice) to the chickpea water to speed things up and stablise the foam. Using an electric egg whisk, whip the chickpea water into stiff peaks – this is super important. The best way to check if you have achieved stiff peaks is to invert the bowl with whipped aquafaba. If aquafaba slides down even a tiny bit, you are not there yet – keep on whipping until it does not move at all. I used an old, hand-held whisk and it took me about 15 minutes to get stiff peaks. If you are a lucky owner of a stand mixer, it will happen quicker. The good news is that (as opposed to egg whites) aquafaba cannot be overwhipped. OPTIONAL STEP: Once you reach stiff peaks, start adding sugar, bit by bit, whipping the whole time. If sugar has caused the stiff peaks to perish, whip the mixture until you get stiff peaks again. Check that the chocolate has cooled down sufficiently – it should not be warm to the touch or else chocolate may seize and you will end up with grainy mousse. Gently fold melted chocolate into whipped aquafaba using a silicone spatula. Do not worry if your fluffy mixture deflates once the chocolate has been added – that’s perfectly normal. 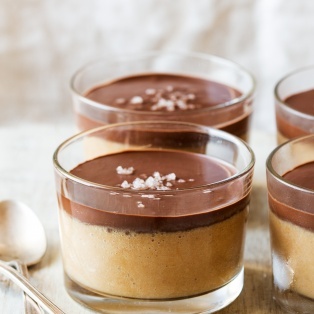 By the time you’ve added all of your melted chocolate, the mousse MAY have more of a pourable consistency. Add chilli powder if using and mix well. Divide the mixture between 4 glasses. Gently stir the mixture between putting it into individual glasses as a bit of melted chocolate tends to drop to the bottom sometimes. Put glasses into the fridge for minimum 3 hours for the mousse to set. I tend to chill mine overnight and it’s perfectly set and fluffy each time. *The exact amount of sugar depends on your taste and how sweet your chocolate is. Sugar isn’t necessary though, I make my mousse without sugar as per video above. If you wish to make your own aquafaba (chickpea water) from dry beans, here is how. If I use tinned chickpeas, I use the ones by an Italian brand called MARA. i couldn’t wait to make this for a vegan friend. I was horrified to use bean water. I though it would taste disgusting. I WAS WRONG. It was yummy. My chocolate did seize the first time. But the flavor was amazing. Next time I made it, it was spot on. Just made it last night and chocolate seized again. I am going to remake it today. Eventually will get the temperature right. I have passed this recipe on to many non vegan friends. This is truly a delicious dessert. This looks great and I can’t wait to try it! Is it possible to use this mousse as frosting for a cake? I am not a fan of buttercream icing which uses vegan margarine or shortening. Keeping my fingers crossed that it can. 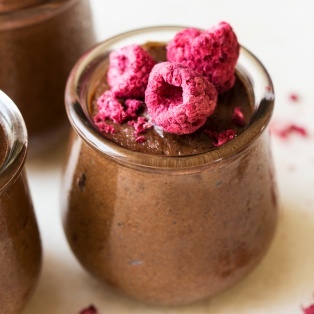 Could I use cacao powder instead of the chocolate? Hi there! Every time I’ve made this recipe, the whipped chickpea water has deflated almost back to it’s original state when I add the cooled chocolate. Do you have any idea what I’m doing wrong? Ok I’ll be sure to try that next time. Thanks, Ania! is a glass bowl crucial to obtain stiff peaks? I whipped (using my stainless steel mixing bowl) for 20+ minutes and still never got to ‘stiff peak’ territory. It worked!!! Although I was a bit too generous with the lemon juice in fear of the materials being greasy. I used the aquafaba from a can of kidneybeans, which had already a nice chocolaty colour. Will definitely make it again. I made this yesterday and got the aquafaba to be really stiff peaks so all good there. However, the mousse ended you grainy. Is that due to the melted chocolate being too warm when folding it in? Tasted ok, just a bit grainy. 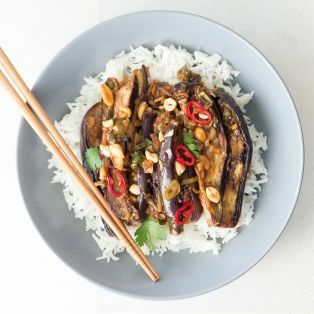 What an inspiring recipe, thank you for posting this! Could you tell me how to proceed when making aquafaba from fresh chickpeas? I usually soak chickpeas with a teaspoon of bicarbonate of soda – is that OK? i then drain them and cook them in fresh water. Is it the soaking or the cooking water I’m using? I’m assuming the cooking water. Does bicarb of soda help aquafaba or should I best leave it out from the soaking process? Hi, do you think you could add a squeeze of orange to the mix? I’m a huge fan of chocolate orange flavour! Just made this for the first time. I whipped the chilled aquafaba until I could hold it over my head in the bowl, then it pretty much ALL deflated when I added the chocolate. The mousse texture was fine. However the chocolate was bitty. Not grainy but chunks almost like chocolate sprinkles distributed throughout. I really want to make this again but I am stuck as to where I’ve done it wrong. Also. I had a large bowl full of aquafaba mousse to begin with that only made two small pots once it had flattened and the chocolate had been mixed in. Hi there! 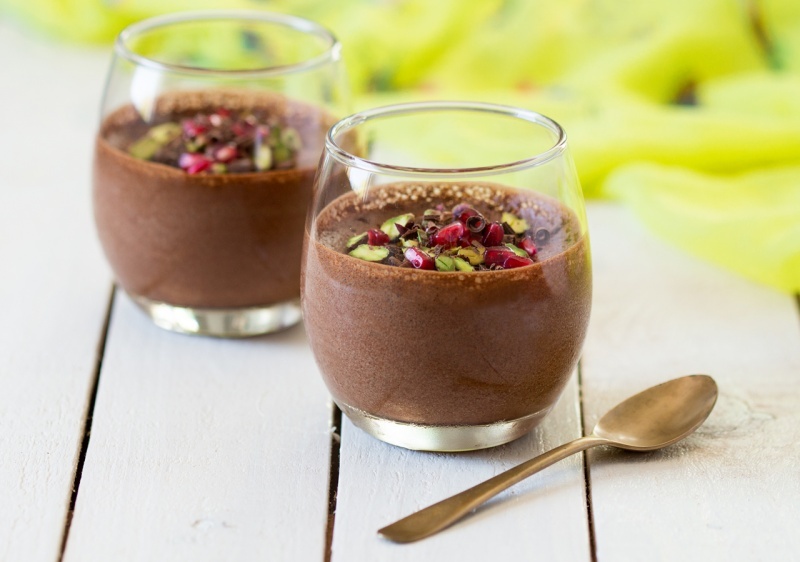 I’m looking for a decent vegan mousse to actually use as a cake filling. If I were to refrigerate it overnight in a tupperware as a large serving, would it still remain set if placed in between cake layers and refrigerated again, or do I risk decomposition due to the changed circumstances? 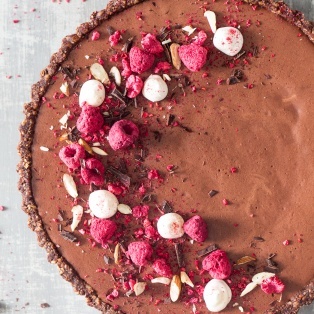 I’ve done my cake filling with avocado mousse, but the avocado flavour was still pretty prevalent, so I’m looking for a vegan mousse that is a little calmer. 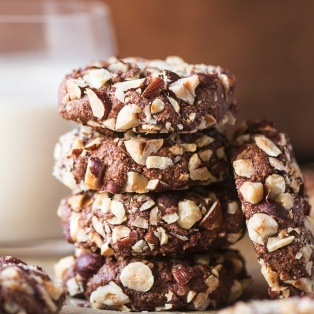 Hi Ania, Thank you for this wonderful recipe! I loved it! But, the only thing is that my chocolate sank to the bottom when I put into the pots. Is that normal? I kept going into the fridge to keep stirring… but, is that normal? Does that mean my chocolate seized? It felt cool to the touch so I thought it was ready? What do you think? Love the recipe, came out really well. How long will these last for in the fridge? Ik made your recipe yesterday for my family’s Christmas dinner. The first batch of chocolate went wrong: I think some steam from the bain marie came into the chocolate so it hardened totally. I luckily had some extra chocolate in the house, so I tried again on a real small flame and with a lid on. That worked like a charm, took some time and a real effort not to stir! The aquafaba worked also very good, I cleaned al utensils with lemonjuice on forehand and it got really fluffy and voluminous. I topped the mousse with coconut whipped cream and some pitachio’s. Everybody loved it! Happy Hollidays and thanks for your recipes! This is one of those recipes that make you wonder why you didn’t make it sooner! Thank you so much for this easy recipe, I absolutely loved my mousse results. 5 star recipe!! Tried this and it was fabulous. Thought my chocolate had seized as was thick and paste like but put into the fridge then whisked it into the aquafaba when it was starting to cool and worked like a charm. The trick is to keep the electric whisk going for quite a while after you add the chocolate in. The cool air cools it down as it mixes in and produces a lovely smooth mousse. Added raspberries and crushed hazelnuts on top. My little brother is vegan and he loved it. The recipe tasted great tanks, but I noticed that after @ 24hrs in the fridge there was some “Separation” and liquid was forming at the bottom of the cups containing the mousse. Was this related to how I prepared things, Or does the mousse need to be eaten within a few hours? I have tried this recipe twice and have failed the same way both times. I followed the instructions step by step, watched the video 100 times. The minute I add my chocolate into the water it dissolves immediately. First time the choc was too hot. And second time, not at all. Please help! I’m desperate to get this right! I never comment on recipes but this time I had to. I just made these and I’m absolutely blown away. They taste wonderful and their texture is better than any egg-based mousse I’ve ever made before. Will definitely be making again. Thank you!! I just made this and added some triple sec to the melted chocolate. It turned out well but it wasn’t sweet enough or chocolately enough for me. Next time I will use much more chocolate and see what happens. I think it would also be good with rum added to the melted choclate. Hi Ania I have exactly the same problem as Edward John, “The recipe tasted great tanks, but I noticed that after @ 24hrs in the fridge there was some “Separation” and liquid was forming at the bottom of the cups containing the mousse. I’m not vegan but was intrigued to try this out – using the liquid from a can of chick peas, that I have always thrown away. I was skeptical but it actually worked and turned out yummy!! Your instructions are spot on.. I only had on hand 60% cacao chips and used 2tbs unsweetened almond/coconut milk – used lemon juice to whip the aquafaba in a stand up mixer, and it whipped! Used a pinch of espresso powder instead of chili powder. The chocolate did seize up a little but it just made very small chocolate bits on the bottom. I never comment on recipes but I have to say this was super cool! I followed the recipe to an absolute T and it came out successful! Husband approved as well! The mousse did not have a chickpea flavour to it at all and it was such a filling dessert for being so light. The one thing I didn’t care for was how long it took me to whisk by hand. I actually spent a full hour whisking just to ensure that I reached proper stiff peaks. The hard work paid off because it came out perfect. Definitely getting an electric whisk now though! Thank you for sharing this recipe.. My eyes are so open now to the world of aquafaba. How long should you let the chocolate sit before folding it into the aqua faba? Thank you. I’ve just tried this recipe even though I was very sceptical. Always have wanted to make mousse and never liked the idea of raw eggs. First attempt at this recipe and I’m really pleased with the results and taste. Thank you so much for the YouTube as that’s really helpful to those who need the courage to learn too. Excellent recipe! I made it for some non-vegan guests and they said it was the best mousse they had ever eaten. They loved the fluffy lightness of it. I made it with 85% chocolate (because that’s what I always have in the house) so adjusted the sugar to approximately 60 g – it was semi-sweet at the most – delicious and definitely not a child’s confection. Also added a good wallop of Frangelico. My only complaint would be that the mouth-feel was a little dry. I wonder whether adding slightly less chocolate would remedy that? Just a few other thoughts: I found it was set perfectly within 3 hours. Also, generally I find that aquafaba whips up and holds its shape better if it is very cold. Perfect every time. Thank you. I add a teaspoon of cream of tartar to stabilise the whites in lieu of lemon. Yum! The aquafaba (wiped up to near stiff, moved ever so slightly when I tilted the bowl after 15 mins of whipping with a electric hand whisk) deflated completedly when I tried to gently stir in the melted chocolate (only very slightly warmer than body temperature). The chocolate also would not incorporate with the aquafaba. So I ended up with ‘soapy’ looking liquid at the top and thick melted graining chocolate at the bottom. Any idea why this happened? In the end, I just gave it a little whirl with the electric hand mixer to incorporate the two and poured it into little cups. It’s in the fridge now. Fingers crossed it works out ok. It still tasted yum though like a very watery chocolate drink. Thanks very much Ania. I will definitely try it again. It firmed up into a pudding and was grainy and not very fluffy. However, it was still quite yummy and it did not separate into two layers. So I guess that is still a win. Thanks so much for sharing and especially for your reply. Hi Ania!!! I am Patricia from Spain and las t werk tried to do the recipe for some friends. When it was just done, it tasted grrat at the texture was great…but then I refrigerated it overnight1. The result was a super hard- thick mousse, not as when it was a t room temperature. It is refrigerating really necessary? It did not deflate, but was super hard…What do you really think that could have gone wrong? I used 200gr chocolate, instead the 140 you suggest…could I skip the long refrigerating time???? 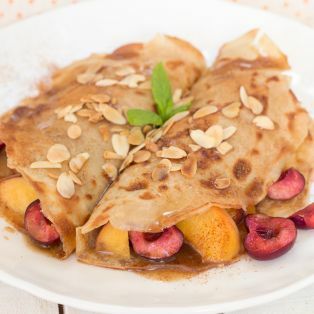 Hello, i was considering making this today as it seems lovely, only question I have though, can you freeze it? I’m a vegan in a family of non-vegans and this is becoming a staple in our hoursehold! We call it “Vousse” (vegan mousse). Third time making this, and I think I’ve finally cracked it! I added soy milk to the chocolate – probably a bit too much in retrospect. as the mousse was VERY light! I also added a couple of teaspoons of maple syrup to sweeten it. I really thought I’d blown it with the soy milk as the mixture turned really thick and gloopy as it cooled. Your tip of adding a drop of vinegar to the aquafaba really helped keep the mousse together while I waited for the chocolate to cool, although it seemed to take a bit longer to whip up? The last two times I’ve tried this, I think I added the chocolate while it was still too warm and it turned a bit grainy; but this time I waited and waited until I was sure it was about to turn solid again, then I used a hand whisk to gently stir it into the aquafaba and it worked perfectly! The finished mousse was super-light and fluffy, just deliciaus. I love this recipe – thanks Ania! Thank you for your reply. I whipped the aquafaba in batches until stiff, but when i added the cooled melted chocolate, following your instruction of slowly so as not to knock the air out, it seemed to deflate and although it is slowly getting thicker as it chills, it seems a bit too lose. Any ideas why and in future how can one rescue it if it happens again?